I absolutely love frozen yogurt. My favorites are Dolci Mango and pinkberry. A few months ago I tried Crumbs, a frozen yogurt place in Causeway Bay that bakes a crumbs topping and scones every day. The crumbs look like brown sugar and taste like a mix of sugar and cinnamon. The shop is generous with toppings, and I love that they use tall plastic cups for the yogurt so that toppings don't tend to fall out and the yogurt does not melt off the sides of the cup. The yogurt is less tart than other frozen yogurt places I have been to, but is still delicious. A small order of yogurt is HKD $28 which includes one topping, and a large order is $32 and includes two toppings. Additional toppings are $4 each. The little shop has no seats and only accepts cash. 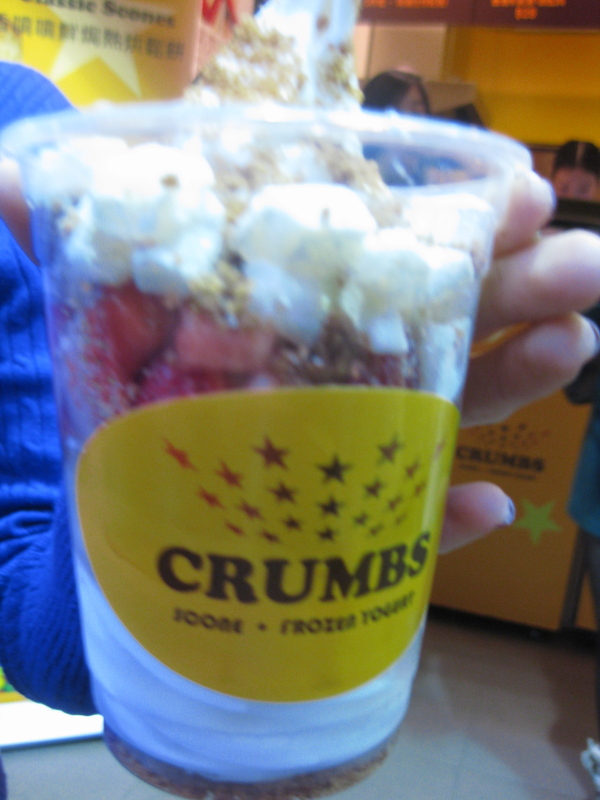 Glad you finally tried Crumbs!! I still miss the Dolci Mango yogurt though. Have you tried the scones? ?